It’s been very long since helmet hit the road and since then slight advancements have been occurring in terms of design, safety, and comfortability of helmet. Similarly, the Kupol team had been on the ball to bring the revolutionary change in the helmet. So, they succeed and come up with a revolutionary idea that turns every, single aspect of helmet design on its head. A team devised a 3D printed Kupol helmet of which materials and components designed to keep air moving, and do not trap heat in. A fit molded and sized for comfort, not a one-size-fits-all model. This helmet gets over all those traditional problems such as rigid and inflexible material, hot, sweaty and stinky, standard sizing, designed for head-on collisions only, and offers basic head protection. 3D printed Kupol helmet left that molded plastic, an uncomfortable fit, and overheating behind. 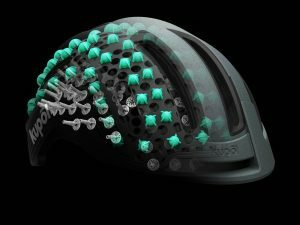 Each of the over 100 flexible, independent pods of the OKTOPUS technology adjusts to your particular head shape, eliminating the pressure points of traditional helmets. It keeps your head protected with the solid 3D printed core. That’s why it has a perfect fit and is lightweight, breathable, and comfortable. You may have heard about the bike crashes wherein maximum cases side collisions involved still, the most helmets are designed for linear impact. That’s why the brains behind Kupol come up with the helmet innovative 3D technology. Outer KINETIC BUMPERS cushion your head in the event of a fall, helping to absorb the impact before it ever reaches you. Middle 3D KORE system is designed to collapse on impact in order to take the brunt of the force and keep you safe. Inner OKTOPUS technology is comprised of traditional polystyrene foam. Soft, flexible, lightweight layers of material designed to reduce rotational motion-protecting cyclists no matter which side of the head is involved in the crash. 3D printing has just not made a safer helmet but also creates a unique network due to hundreds of tiny holes that allow air to flow through freely. In addition to this OKTOPUS pods offer structural support while also it permits air to circulate. It fully ensures you keep a cool head on even the hottest days. The Kupol helmet was designed to be a pleasure to wear and breathable helmet means a better ride.